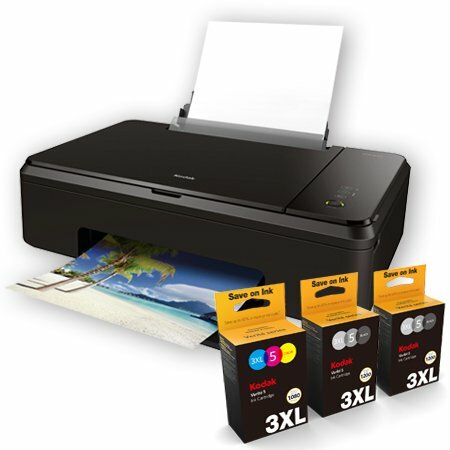 This printer uses KODAK VERITE 5 Ink which will save you BIG on the cost of replenishment ink. It comes with the equivalent of 18 standard ink cartridges in the box. And you can use up to 30% less ink with the all new Eco Button. It even helps you save on paper by printing automatically on both sides. This printer is perfect for anyone that is tired of paying for high cost ink. Easy to use, easy to set up, and easy on your budget. The Flick to Print feature and Facebook and Instagram integration in the Kodak Verite App make it simple to print your photos right from your phone in seconds.